Football has never been so much fun, in this stunningly playable, adrenalin fuelled recreation of the beautiful game. Intuitive controls & lightning fast online play. A world of soccer is waiting for you. The first in a new series of fast, fun easy to play sports games, Sociable Soccer is a fusion of old fashioned arcade playability and modern technology, a serious sports game with a friendly face. Using a secret formula to accurately speed up player selection, passing and tackling the ridiculously addictive gameplay stems from simple, familiar controls where every tenth of a second really counts. The game is developed by Combo Breaker. 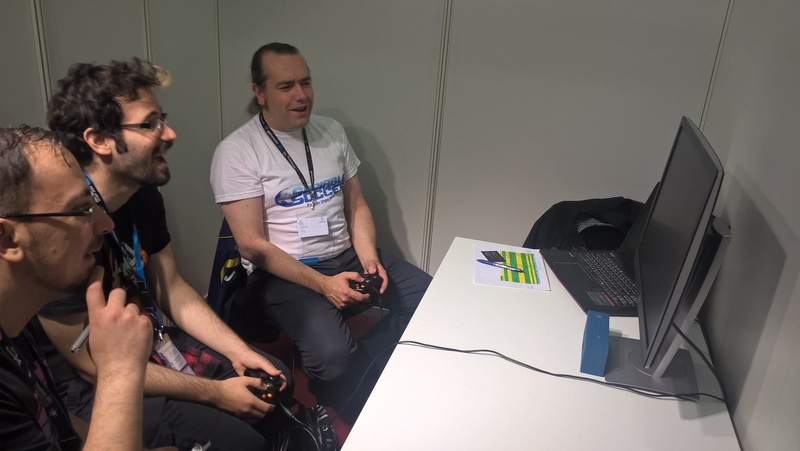 We had the chance to play a couple games of Sociable Soccer and then talk to one of the main devs behind the development of the game. We were shown much of the Single Player content that the game has, with all the special “manager career” stuff that is built-in the game as well as all the multiplayer things we will get to enjoy once the game is up and running. The game has about 30.000 players in it and a lot of teams from many countries to choose from. The most interesting part to take away from the whole experience that we had with Sociable Soccer though, definitely has to do with the fact that it felt like a fast-paced arcade game of the old times. Nothing like FIFA or any of that fancy new soccer stuff, but rather like a hard-boiled, very fast soccer game that you would find on an arcade machine. We were told that one of the main features of the game was going to be that it will have cross-platform access, allowing someone who is playing the game on his PC, to play with someone who is on console or even mobile. The fact that the game is so light also helps with being able to run the game on various platforms. The game is planned to come out on Early Access and a lot more content will come right after that happens as well. “Things like ‘Make Your Own Cup’ with friends will definitely be coming to the game,” the devs explained. The studio behind the game, Combo Breaker, which is based in Helsinki Finland has a lot people who came from game development jobs of high profile AAA games and therefore has a lot of experience in creating games. The developer we talked to ourselves, Jon Hare, actually told us that he had experience making soccer games for more than ten years. “Our aim is to take this beyond football and into other sports as well,” he explained and then told us that a lot of kids actually liked the game because it is easy to learn but hard to master. You can find the game and play it during Gamescom 2017 at Hall 10.2 L13 so do not miss out and go get some soccer action going with you friends while it’s still there! You can check out Sociable Soccer through its website, Twitter, Facebook and its Steam page.